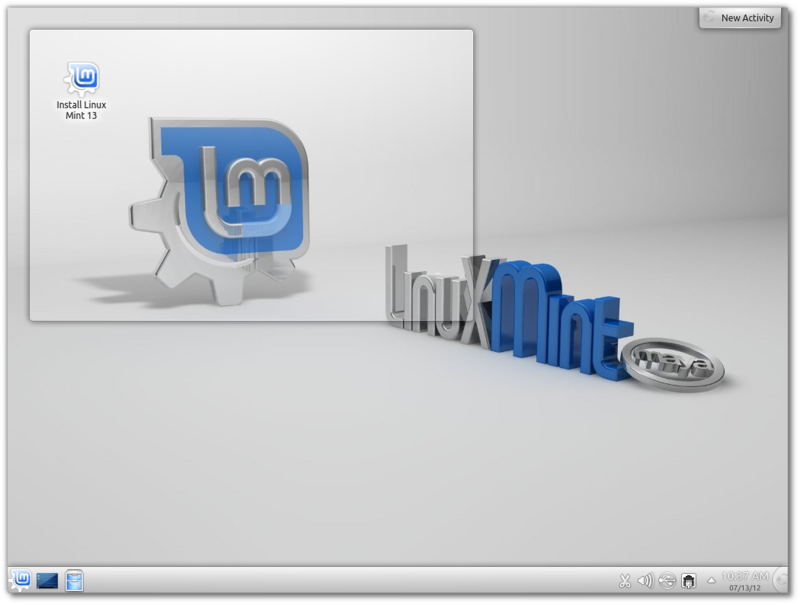 The team is proud to announce the release of Linux Mint 13 KDE. 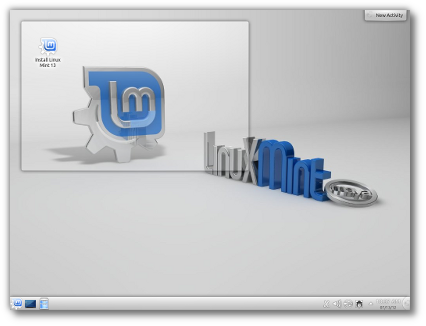 Previous Previous post: Linux Mint 13 “Maya” Xfce released! Excellent! Congratulations to the entire Linux Mint KDE development team! Hi.. thanks for this release, already installed on my netbook and PC. Hehehehe.. I have been waiting for this. Thank you Clem and the Linux Mint KDE Development Team!!! I downloaded the iso’s for the 32 and 64 bit versions last night. Hope to test the 64 bit version on an extra machine before committing the upgrade to my main machine. Sure would like an “OEM” ISO for KDE since I’ve always thought that KDE is the best desktop to wean a Windows user with (but Kubuntu was never as polished as Ubuntu). I’ve rescued many old Windows machines by putting Linux on them and giving them away on “Freecycle”, the OEM image is perfect for that. Also, a DVD is a terrible thing to waste….couldn’t you come up with a combined ISO that would install both 64 and 32 bit versions (choose at boot time, or have the bootstrap identify the cpu type and memory size and choose based on that … with a user query)? Or perhaps you could fit the Mate, Cinnamon, and KDE and XFCE flavors on one ISO and let the user choose before the install starts? I know the ISO size would increase, but such a disk would make a great giveaway! I like Linux Mint KDE but i can’t type unicode with scim ( or ibus-unikey ). How to fix it ?. Many thanks!! Congratulations to the team, and thank you all very much! I’ve been using the RC since it came out with no issues, and I’m going to stay with Mint KDE for awhile, since my current projects are easier if I don’t keep switching distros around. Fred, Clem and the Mint staff: Mission accomplished! Mint 13 is complete, now the problem for us users is to choose one! All of the versions are superb!! Thanks!!! PS I mean: choose one when booting, of course! Hey Clem. Is that the same isos that was talked about in the xfce post? I downloadced that ISOs and they have the same size in mb. Got the 32-bit ISO and writing it to a USB stick now!! What does Clem mean by “Boot hangs on systems with b43 wireless cards”??? I have a Dell Inspiron 1545. Would like to know if this brings all the KDE software or if it’s trimmed down a bit. In kernel 3.2.x, trying to boot a system using the b43 card when the firmware itself is not present causes a kernel panic, preventing boot. The workaround is just to blacklist the driver in grub and then install the firmware, at which point you can presumably remove it from the blacklist. This is presumably a pretty new bug, as I didn’t encounter this when I did a fresh install of LMDE last month (kernel 3.2 based) on a laptop with a b43 card without issue. Installed this yesterday onto my hp6930p laptop and so far it is working like a charm. I’ll be running this and ZevenOS 2.51 to see which KDE implementation I like the best. So far, I have seen 3 KDE crash handler events in ZevenOS and zero issues with Mint KDE 13… so score 3 points for Mint KDE 13 so far. 😉 Great job!!! installed 64bit version and already found ‘bug’….chose to log-in automatically from setup but when installed and updated that option has gone….how do i re-enable autologin? Really happy with 13. Everything I need works like a charm. Been trying lots of other distros recently but always come back to Mint. Cheers to all concerned in this release. @montee – “System Settings” (press ALT+F2 and type “settings”, and select “systems settings”) and select “Login Screen”. Why is there no installer from OS windows (as in linux mint with gnome)? How to install a windows 7 (no cd-rom)? What an excellent suggestion, how about it Clem? I did a fresh install of the 64-bit version. Here’s my experience: I had to use the “nomodeset” boot option to fix getting a black screen with my Nvidia graphics card. Installation went well, but the system refused to reboot correctly, preferring instead to beep every ~5 seconds on a black screen (had to use SysRq to reboot properly). The same rebooting problem happened again post-installation. Haven’t tried rebooting since installing the proprietary driver, though, so that might have fixed it. In addition, upon starting KDE, I got a message complaining about a non-existent ~/.local/share/contacts; after making this directory, the messages stopped. These problems might be because of my strange computer, though. It seems that, recently, all Linux distros have taken a disliking to my hardware and have various issues. No troubles at all besides that. Everything else is working perfectly. I forgot to mention that I installed via USB which might have caused some of the problems. I just rebooted and everything turned out better than expected. este momento estoy mamado, cansado de trabajar win 7 o cualquier otra vesion, por eso me gustaria trabajar con linux pero tengo un incoveniente que debido a mi profesion me toca manejar programas que funcionan en las versiones win como soliwork, autocad, proteus, mplab y otros etc, entonces me preguntaba si hay la forma o posibilidad que tambien funcionen bien en linux. mu8chas gracias por su atencion. But why Gimp 2.6 and not 2.8? Other than that I’m really happy with it, KDE and LM rocks! So now im in a tiz- do i go for the new xfce or this kde. well done team- going to put this on a vm. I have not always been a fan of kde but am determined to have another go. I use DVD-RW for all my linux distros. I keep one for 32 bit and one for 64. When a new version comes out, I erase the disk and write the new version on it. It is a little bit slower, but no wasted disk. I have been using the same disks for years. Just installed Mint KDE 64bit on my test computer. I added Cairo-Dock and it’s looking real nice! This is looking real good as the upgrade for my Mint 9 system! Re “boot hangs on systems with b43 wireless cards”: You might want to clarify on this page that it’s the live dvd boot that hangs, although I haven’t had the problem and I supposedly have a b43 wireless card in my Lenovo Thinkpad W520. May state it like: Live DVD boot hangs on systems with b43 wireless cards. I know I’ve had a couple of associates that saw that and immediately stuck with their current version rather than upgrading. That wouldn’t be such a big deal in my mind except for the fact that they chose a different distribution. Not a Mint distro. Nice…. I”m a KDE fan again. Congratulations, and thank you Mint team, already installed on my laptop. Wonderful! The best KDE distro available. Glad to see KDE get some love…seems everything is about Gnome/Mate/Cinnamon these days. JUst a superb distro that deserves the limelight! I’ll be running it exclusively! I work with it no on my laptop. I would prioritize the KDE edition over the XFCE edition (would release it before xfce) as both KDE generally and KDE in Mint are obviously better (more polished, more feature complete) than the XFCE counterparts. I wonder if the Mint KDE user base is larger than that of Mint XFCE. Does Mint use the PAE kernel? So do I need to have a PAE-capable processor? Edit by Clem: No, Linux Mint doesn’t use the PAE kernel for its 32bit ISOs, you can use them on non-PAE CPUs. For myself, I am happy using LMDE and Maya Mate 13, but it is always good to see other users being given the chance to use their preferred desktops. Mint excels at listening and giving choice. Spot on. Just edit your source list from lisa to maya, oneiric to precise and save yourself the trouble of reinstalling. Congratulations and thank you very much to the whole development and testing team. Again a wonderfull job done. I’m just returning from my holidays (with very little internet access 😉 and find this great surprise at my return. Super ! You are forgetting about the Mint Update program, the longer test period, the correction of founded bugs, the different choice of software and a lot of other little things. If we want talk about Mint Main, the differencies are greater. Audio does not work on VLC in Linux Mint 13 KDE. Please suggest any workaround. Thank you very much indeed. I greatly appreciate the fact that Linux Mint continues to support KDE. I have waited a long time for this release, and now I look forward to installing it and using it for the next several years. Keep up the great work! Thanks Mint Team. I’ll install tonight replacing my Mint10 Kde. Thanks for support KDE. And in addition I think on future, KDE should be Debian Based. Great job. Problems with Internet Access, Networking, DNS, VPN, etc: Use of dnsmasq in NetworkManager.conf is causing problems. 1) Create a file in /etc/profile.d folder called whatever you like with a .sh file extension. Something linke my_environment.sh. 3) Now save the file and reboot. This script is run anytime you login to your desktop environment (KDE in my case). The “PATH=” line adds the contents of other environment variables to your PATH environment variable. I couldn’t figure out why it wouldn’t install onto a USB stick properly using Unetbootin, so I ran an MD5Sum check and that’s what it came up with. Okay, guys. I’m not a programmer. I’m not a hardware geek. There are probably a LOT of folks out there just like me. Even though I’ve been using computers since the early 80’s, I’ve NEVER been comfortable with formatting hard drives, repartitioning hards drives, or the terminology accompanying these acts of digital terrorism. Is there some reason you can’t develop an installation program that identifies the OS that’s installed in a particular partition? I had Mint Xfce and Lubuntu installed on my desktop. Mint KDE comes up with a suggestion to repartition, but all the examples are the same shade of blue, and I haven’t got a clue (nor am I interested in getting one) which one was on SD1 and which one was on SD6. Couldn’t it just say which OS is on which partition? And if it must be obtuse, at least get a little more contrast in the colors for us old folks out there who have to squint at it anyway. BTW, since I had just installed Mint Xfce, I elected to install Mint KDE on the whole hard drive and then install Mint Xfce alongside it. That installer is a bit more user-friendly. On the bright side, I’ve never really liked KDE, but I do like MINT. I still think Xfce with the Mate menu is the best I’ve seen, but if KDE can be done well, I know you guys are the ones to do it. Thanks for your patience. It’s ok to install the nvidia-current-updates and nvidia-settings-updates driver packages. You should be able to use the Additional Drivers application to do this (applications / system menu). Before the NVIDIA driver will be used and it’s applications show up in your menus, you’ll need to make sure your Diplay setting in your BIOS is set to Descreet. Not Integrated. The Integrated setting makes it use the onboard Intel graphic card. Descreet will tell it to use the external/non-integrated NVIDIA card. Anytime you make changes to the video / graphic card settings you’ll need to reboot the computer to make sure you get the changes applied. Also, if you have a docking station with multiple monitors attached you’ll probably need to install the NVIDIA driver to get your settings to be saved and re-used each time you start-up your computer. The Neauvou driver with the Monitors applet in System Settings didn’t seem to want to save my configuration settings. Use the NVIDIA X Server Settings app to configure your dual / multiple monitors. Then save the settings to your xorg.conf file (click Apply then Save to X Configuration File). These settings will be used each time you start your computer. If you start your laptop undocked it will not find these monitors and will just go with default settings for your laptop screen. If you want to see what’s in your xorg.conf file it’s located in the /etc/X11 folder. One issue with the new KDE distro. I just noticed that I never see the grub screen on startup. If I already had windows installed in another partition would the default installer have enabled grub to let me pick which OS to start? I will need that on my main computer which now dual boots mint 9 and win 7. Ken try update-grub in console as root and see if that helps.. If not, post here and I will explain You how to add manualy the win partition in grub menu, by console.. I am downloading 64 bit version of Mint and it is taking for ever. Is there any way to speed it up? I hope it works. How do I get a dvd with iso on it? You guys do a terrific job. Keep it up. Erm, how can I set google to default searchengine in firefox? 1) I’ve a epson TX135 multifunc. so I usually get de ISCAN for this. I did it on LM13 Cinnamon/mate and LMDE 201204 and everything is fine. But not work on LM 13 kde. 3) For any razon, install the ATI driver is impossible, at least by the Additional drivers soft. I had not any problem with this on LM13 Cinnamon/Mate and LMDE 201204. 4) The default fonts !!! It’s terrible. In some cases is impossible to read. I changed “ubuntu – size 9” for “sans-serif size 10”, and touch the antiaslasing, force ppp to 127 and I don’t remember what else, to get a razonable reading interface. If LM KDE is ubuntu based, why dont include libgtk-x11*. * on this. Why things that work fine on main version ubuntu based, don’t work on KDE ubuntu based. I had LM 10 KDE Julia and everyting worked well on this. The LM13 KDE RC was just a few days as “RC”. It became in “Stable” very quicly. What kind of feed-back is possible to considerate on just 3 days. In my opinion, this is a RC2 version. Am fairly new to Linux.Installed RC and updated thro’ Update Manager. Running smoothly,(yet to try out all the installed apps) except for some Desktop effects like Blur, Glide, Desktop Cube..”could not be activated” Tried changing Compositing type from XRender to OpenGL in Advanced config,- no effect. Perhaps should install NVidia proprietory drivers and try again. Despues que haceslo, installa tus programos de trabajar. Si no puedes hacer este, necessitas dual-boot o usar Virtualbox. Usa Google por este. Hi dudes! Excellent work. Linux Mint is my favorite distro (also like Ubuntu, OpenSUSE and the new ROSA Linux) and KDE is my favorite desktop. But there are three things that I don’t like in this distro… First: Why the packages are so obsolete (Firefox and Thunderbird 12, not 14 and GIMP 2.6, not 2.8)? Second: Why don’t replace LibreOffice for Calligra? It’s not as famous as LO (‘couse it’s a brand new suite forked from KOffice), but it’s the most complete office suite there I’ve ever seen and it’s specially developed for a total integration with this environment. And Thirdy: PLEASE make a new theme for KDE, the only thing that I don’t like in this desketop is de horrible, ludic, baby-look and rounded window borders, buttons and everything. Make something more elegant, adult and quadrate as the themes of others desktops. Look at ROSA Linux and Mandriva, there are distros with a highly customized desketop theme… Why it’s so dificult to find a decent theme for KDE? Why everything in KDE needs to be blue? It’s Linux MINT, make it green and customized like others editions please! Creo que los archivos que generes son compatibles con los dwg de AutoCad. Las otras aplicaciones que mencionas no las conozco, pero esta página esta buena para saber si tenés algún equivalente. Paso 2, es una vez detectado el programa que te interesa, ver si está en los repositorios de la distribución linux que elijas, de ser asi, instalarlo es tan simple como hacer click en un botón, sinó tendrás que descargarlo e instalarlo manualmente, lo cual a veces no trae problemas y otras hay que trabajar un poco. FYI, I just updated mintUpdate (my current version says 4.4.2) in LM13 KDE 64-bit. After it updated, the update window did not close and restart as I’ve seen before. I had to close the window manually, then log out and in. Then I was able to run update again and got the latest updates (mostly LibreOffice stuff) without issues. – Dualbooting with Win7; when I replaced Mint 12 Cinnamon with this, the installation broke my bootloader. With every option in Grub, including the memory test, came text “No such partition”. Maybe I did something wrong. I repaired bootloader in LiveCD console using yannubuntu. – I don’t know if it is due to KDE 4.8 or what but using KDE is now super smooth. This is surprising to me because last time I used KDE (it was with Kubuntu 11.04) memory and CPU loads were very high. I have never experienced this smooth OS that is filled with eye candy. It would be interesting to try MintKDE with a bit older hardware. – So far only problems I have had are related with Mint software manager. When I try install something with it, it doesn’t seem to finish the job but when I check if the program is installed, it usually is.And sometimes it shows programs installed that I had previously removed. – It takes 5-10 minutes for Amarok to launch with my 30 000+ song music library. Had same issue in Kubuntu. This may not be a bug but it then is a serious design flaw in otherwise seemingly great program. Had to replace it. -With its great smoothness and customizability this is the best Linux distro I have so far used. So many little bugs and annoyances I experienced with Gnome-based distros are gone. True pleasure and sense of freedom! Not everybody feels the way you do about how KDE is put together in Mint. I’m living proof of that. @67,69 – yeah, really why KDE version of Mint is Blue, have you ever seen blue mint leaves 🙂 ? It would be funny if someone will implement a KDE distro in other colours, rather them blue. Infelizmente muchos de los programas que usted indicó no funcionan bién en linux, mismo utilizando wine, por ejemplo, autocad, apesar de que existem programas para linux que manejam archivos .dwg, no lo hacen tan bién como el original; és más, si no existen buenos programas (autocad, etc) para linux, nó és problema de linux y sí de los desarrolladores de programas. Le aconsejo a seguir usando windows para esos programas, para el resto (email, internet, video, sonido, etc) puede usar Linux mint que és muy bueno! Tu español está muy bueno! I like Libreoffice, and I need it in LM KDE because can generate / read MS/Office documents; calligra not. Great work guys. I’ve been using it since the RC and it is working great. For those having trouble installing specific applications you might want to look on the website for that specific application to see if they have specific instructions related to KDE installations. There might be some extra libraries that you need to install. If so, just open the Software Manager and type in the name of the library and search for it. It’s most likely there. Then just install it and try your application again. I’m pretty sure Linux Mint KDE is base on Kubuntu so if your applications work on Kubuntu they should work on Linux Mint KDE. If it doesn’t work on Kubuntu then there is probably an “upstream” problem. This means Kubuntu may have removed something that you need to run your applications. Therefore, it would also be missing from Linux Mint KDE. For different window borders you can change from the default to a different Window Decoration in System Settings / Workspace Appearance. If there aren’t any there that you like you can click the Get More Themes button and install others. You might need to logout or reboot for KDE to fully pick up any changes you make. If you didn’t get the latest version of software, like Firefox and Thunderbird, just give it a couple of day and you’ll get them in the updates through Update Manager. Depending on when you install, you’ll probably get them right after installation when the system automatically checks for updates. It takes time and resources to recreate ISOs, create and keep track of their versioning, and then get them out to all the mirror sites for downloading. It’s much less expensive to release an ISO and then let the system keep it’s self up to date. The Mint Update Manager even ranks the stability of the updates offered so you can choose just the ones you’re comfortable installing. The nice thing about Linux distributions is that there are lots to choose from. The bad thing about Linux distributions is that there are lots to choose from 🙂 You can find out which distributions are being looked at most often by checking out distrowatch.com. This will give you a good idea of which distributions people are watching the most. Generally the most watched are the ones that are most stable and usable. You just have to do a little homework. I like to download “live” CDs/DVDs and put them on a USB flash drive with Unetbootin (which you can install from Software Manager). You can then boot your computer from this USB flash drive and check out how it’s configured, what applications it comes with, what they’ve done to the DE (ie KDE, GNOME, Cinnamon, etc), which packages they already include in their repositories (see whats available through Software Manager, for example), how complete their networking features are setup, etc. Personally, I’ve found that the Linux Mint distributions are the most complete and ready to use right after installation. You don’t have to go looking for drivers, codecs and other stuff to be able to immediately start using your computer and all of it’s hardware features. Drives, wireless, networking, VPN, etc. all just work. The benefit you get from Linux Mint is that you get a Debian Linux based system that Ubuntu/Canonical has polished, upgraded, customized and made ready for use in a corporate environment AND then you get the same kind of work being done by the Linux Mint developers. So, by the time we get it the distro is pretty darn solid and ready for prime time usage at work or at home. Do a little research and you’ll see all the great contributions made by the Linux Mint team. You get the much more useable Mint Menu, the much friendlier Software Manager, an Update Manager that ranks the stability of the updates offered, etc. just to name a few. Yes, I’m a big huge proponent of Linux Mint and that’s because I’ve done a lot of reviewing and testing of other systems and found it to be the most usable, stable, easy to install and ready to go right out of the box. Is LM13 KDE a LTS and is ita considered a rolling release? A few days ago I wrote that I encountered minor problems with Maya KDE rc, however since the official is out I downloaded and installed it. Everything is working quite well. Honestly, why would you use any other OS? The best is right here. Thank you Clem and company. P.S. Don’t forget to donate to LinuxMint if you like what you see. Right. But I think that the present space is a place to expose our individual opinions. It’s how about each one feels, not everyone. To specify the universal feeling is impossible ’cause divergence is part of the human nature. That’s the reason why I start my text with the sentence “there are three things that ””’I””’ don’t like in this distro…” But I respect the fact that not everyone needs to agreed with me, for the same reason that I don’t need to agreed with you and also have the legal rights to say that, ok? About the theme: It’s not really about the blue colour, but the absolute abstinence of customization. Why LM-KDE is the only edition that don’t has a singular Linux Mint theme? I really don’t like the rounded borders and controls. But it’s just my opinion. The addition of a new theme will be really welcome. Mint KDE does have some customization ) the icons pack I guess. And I wouldn’t change anything in the current theme – it looks just fine. A green theme would be no nicer at all, imho. See Opensuse – it’s green, but there’s nothing special about it. After all, you can take whatever theme and install it. I used to use the Pardus’ theme on my previous KDE install – ah, what a theme it was, the best and most professional theme for KDE ever (no longer updated, though, and the distro itself is discontinued). You can even create your own. So I don’t see any need to alter the KDE theme for Mint. – I miss a nice introduction story about Mint during installation (just like the other Mint 13 versions). I do not know if this is due to the selected install language, so lack on language support. Maybe a suggestion about the menu….is it not wise to default install the Lancelot menu? It looks like mint menu. I hope you have workarounds or fixes for my above mentioned points. But for now Linux Mint 13 KDE and Xfce are the best for me. It would be nice if you can combine them….so the the resource usage of Xfce and the user interface of KDE. Note: Look at the installation instructions on the last link, in Gnome the process can be done with a single click! I can’t create my own theme ’cause I’m not a developer, just a user with a simple solicitation. It’s not needed to replace the official KDE theme, just to add a new as an alternative (it can be the same of the others editions, it would be sufficient). Now, with the update of mintUpdate, things start to work fine. I love KDE, it’s so powerful, finest and elegant. Mint KDE does have it’s own theme. The Start Menu Icon is Mint specific. The background is Mint specific as well. I’m sure there are a handful of other things that are Mint specific. Could there be more customization? Based on opinion, there should be. But it’s unfair to say there is absolutely no customization. The best part is you can do whatever you want to with it, to make it just the way you like. That was really my point about voicing your opinion, but I realize that I didn’t elaborate very well, as I got pulled away. Yes everyone has the right to voice their opinion. But from my observation, it’s the posts that include constructive criticism about certain functionality that isn’t working as expected, or broken if you will. Form follows function, or so I’ve been told. I guess what I’m trying to say is if you want to exercise your legal right to state your opinion on how Mint “looks,” wouldn’t it be so much more productive to customize the desktop to how you think it should be, and then submit that to Clem? If you aren’t willing to do that, then I question how badly you really want the changes to take place. Anything less is just an opinion, and you shouldn’t be surprised if not one thing changes in your favor. But, you are correct. You can state your opinion any time you want. 1. the system does not detect and use my wireless card on install and I had to use cable. Mint 13 Cinnamon 64 did automatically as did Ubuntu. Odd backward step. 2. Why do we all have to download (6 mins) of language packs? Can’t this be an option? 3. As KDE has just been released, why after install are we required to download >200Mb of upgrades? The initial download, language packs and then upgrades really hammers your personal monthly bandwidth. Ooops – on reboot something crashed. A crash reporter was opened automatically and I tried to download the necessary reporting tools (15 mins download) which then installed (5 mins) – and reported that it had failed as it was unable to download / locate various files. Now, I’m none-the-wiser what happened and still can’t submit a report! Sorry, but I don’t think that I was a desctrutive critic, I started my comment with the eulogy that Linux Mint is my favorite distro. After that I did 3 simples objections. And there is no rule saying that only broken fucntions can be criticized, I think that aesthetics are also part of the project and I remember that the logo of this edition has been discussed democratically right here before be choosen. And yes, I’ve noted there is a bit of customization as the start menu icon and backgrounds, but you need realize that’s far away from the customization present in other editions. But considerating the fact that i’m not a developer, I think that I need to shut up, right? Because although Linux being a free, open-source, stable, highly customizable, secure and modern operational system, there are some disgusting statistcs that gives me insomnia: We are only 2.9% of the computer users on the world (https://linuxcounter.net), maybe less than 1% (http://www.dudalibre.com). WHY??? Linux is so f***king awesome, why nobody cares about the penguin? My theoretical and more disgusting awnser for that is pretty simple – the way of think of Linux users and developers. Not just open, Linux development is absolutly anarchic! So, if somebody want/need something differente, the awnser that it’s frequently listened is “do it by your self!”. So if you are a programmer, you are able to make a fork (there are more forks in Linux development than stars on universe). But if you are not a programmer… The awnser is: F**k off, it’s not my problem! So, if you have some problem with the hell of packages manager that turns a installation of some applications really harder than in Windows or MacOS X, there’s no altruist in the Linux development comunity who cares about you ’cause this system is ok for them. So that’s looks a truely convincing explanation for the question “why Linux is so impopular?” – It’s because is a system made by geeks and for geeks! So If you are not a geek and need/want something more flexible to you, buy a Windows. Sorry, some months ago I tried a distro with calligra and it not opened Offices documents, but if the reality is another now, point for calligra! Guys: You are an incredible bunch. I am an older computer user and cannot get over the amazing amount of work and desire for perfection you have placed into these Distros. I am so lucky to be living in this day and age. Your effort and intelligence will never go unnoticed. Thank you! Keep up the good work! By the way, I am using Mint KDE in three machines now and it rocks! Even with the B43 wireless hang screen. It is just a matter of time before one of you guys finds the fix. Thanx again! I’ve been using 13 KDE for a few days now, changed the kernel to one that won’t crash my system (an Ubuntu problem, no fault to the Mint devs), and put all my preferred applications in. I also had to turn off the GL2 Shaders because it was causing some severe lag in my poor old laptop. Other than a few nitpicky things, I have to say that Mint 13 KDE is the best implementation of KDE I’ve seen yet. For one thing, it’s absolutely GORGEOUS. Secondly, after turning off the GL2 shaders, it’s quite snappy even with the effects going! Bravo! My nitpicks… this is the first Mint edition that I’ve seen that didn’t package Thunderbird and Pidgin right off the bat. I could never get KMail to work, and while I like Kopete well enough (does what it says on the tin), I just prefer Pidgin. I just find it odd that the sole browser would be Firefox, but it wouldn’t have Thunderbird as the default mail client. It’s really no big deal, though. A quick trip to Synaptic Package Manager solved the whole problem, as it typically does. Anyways, big KUDOS are due to the Mint team!! I’ve fallen in love with KDE again :D.
After having tried Mint 13 KDE for some time now, started with the RC, I now have a feeling it is a bit slower than Kubuntu 12.04KDE. Everything reacts a bit slower, it’s not just one program, boot and shutdown are slower, it’s just a general thing I see here. No idea why, since Mint is Ubuntu based, right? And Kubuntu is also Ubuntu based. What could be the difference between the two KDE versions that would slow down one, although just a little bit. Tony, yes it is an LTS release with a lifespan of 5 years, and no it is not a rolling release. If you like that you have to try LMDE (Linux Mint Debian Edition) which is not Ubuntu but Debian based. Okay, as have said earlier, Im gonna install this one, it works on my old machine with Broadcom STA wireless driver. It boots fine. Update-Grub worked on Mint-12 to add grub boot screen. I haven’t yet tried updating my dual boot Mint-9 machine yet, just testing Mint-13 KDE on another computer where it is the only OS. But JIC how DO you add windows to the grub boot manually? (That machine has Windows on SDA and Mint on SDB). Also how do I get the kernel boot messages to appear during boot? I can’t stand the blank screen, I’d like to know when my disks are being SFCK’ed (and have the option to bypass) otherwise I might think the boot had crashed when the delay was normal…..
How come Kubuntu has its logo in the right top corner of Menu and Linux Mint Has not? Otherwise great job ever, well done! This is great and all but when is linux mint 13 lxde coming out ? So far this has got to be the best version of Linux Mint that I’ve ever tested. Keep up the great work guys!! Is there anyway that someone can donate without transferring money via the web. I still prefer snail mail if all possible? I installed it on my laptop and love it. One remark – something you forgot and which is easy to solve, but can create some frustration to less experienced users : Firefox is installed as browser, but it is not set as “default browser” in the OS. Can be fixed simply in the “advanced preferences” by clicking on “check now if Firefox is the standard browser”. But this should have been set already by default. Because of this, the os asks which application it should use when you click on a url link in an e-mail or in a document. Maybe this should be added as a standard test for your test team ? Looks good! Anyway I’m not a developer, but I tried a French Ubuntu based distro, whose name is Hybride which features ALL the available desktops (Gome, Gnome Fallback, KDE, XFCE, Enlighenment etc. but not Mate and Cinnamon). And I wonder if a similar thing wouldn’t be possible on Mint… Best regards. Now my lovely thinkpad (x120e) rocks with this shiny, solid, lighting speed and attractive system. LM KDE is the distro of choice for me from now on!!! A huge thanks to the team that worked hard for this release. I guess that I will not be using Linux Mint. Linux Mint KDE has too many error messages. Linux Mint XFCE locks files that are uploaded to the document folder and Linux Mint MATE crashed after opening and there was no panel. Thanks wonderful Linux Mint Team–great KDE release, love it! So far, works flawlessly (with a tiny bit of tweaking) on my Lenovo laptop. Yo, Martin, ever consider you might have a hardware problem? The best Linux that I ever installed. Did not discover any bug, flawless! Everything is working as I expect it on my ACER ASPIRE 4820TG, booting from extternal TOSHIBA 1.8″ USB HD. Even Skype and installation of ATI driver from system apps without problem. Previous version (12) needed manual installation of ATI driver on my laptop. Mint KDE too many error messages?! What are you talking about? What error messages? I wasn’t accusing you of being destructive. I really wasn’t accusing you of anything. I appreciate that people have their likes and dislikes, and that’s not destructive in itself. I was merely posing the idea of a more proactive approach when it comes to the development of Linux Mint. If we don’t have the knowledge to help Clem with actual code, that’s fine. I know very little about code. And again, it’s one thing to inform Clem of some functionality that is truly broken, even if it is something small, but we lack the knowledge on how to fix it. From what I gather, Clem appreciates hearing about those things, and he does his best to address areas of functionality by tweaking them and/or completely repairing them–whatever the need may be. However, it’s quite another thing to simply list off things that we don’t like of an aesthetic nature. It has been my impression to leave the reviews to the reviewers, but for the blog, this is where Clem gets ideas on how to fix things and make Mint a more “out of the box” solution. But that’s just my take on it. That could be a load of crap. I also apply the above to myself. Great Distro !!! Works great K53S Lappy! No issues at all! Congratulations !! When I first tried KDE, it was with Mint 12. I didn’t care for it then. I’m now using Mint 13 KDE and love it. Especially Kontact as a PIM. I’m not sure about Amarok as a music player, but I’m giving all the included apps some time. All in all, this is my favourite DE so far. Nicely done! where is malaysia mirror ? i have just installed maya mate 13. and now i want to install kde 13. i am new to linux. however, i have spent some time with ubuntu and kubuntu. is it possible to have mate and kde at the same time on my Dell vostro 1450. From Synaptics, search and install …. It’s work for me. May be sound bad at the begining, just give it a few seconds, and then self-corrects. You can upgrade Kubuntu, you can install the softwares and Mint has more bugs than Kubuntu and guess what, you can also install the wallpapers on Kubuntu. Is possible to have an Italian release, as mint12 Katya ? will we have an update kde 4.9? as it is for kubuntu don.t work with mint kde. Good day! How to install latest Adobe Flash Player as I check on adobe site I got still 11,0,1,152 since the latest for linux is 11,2,202,236. Linux Mint 13 Maya 64bit (KDE 4.8.4) using Firefox 14.0.1, I already install all updates. Thanks in advance! You might try moving ‘Network Boot’ to the top of the Boot Sequence menu of the BIOS menus. Boot Sequence menu. But that worked for me. I have no idea about what is happening ‘underneath the covers’ that would be solved by the ‘Network Boot’ trick. If anyone has a technical explanation, I would love to hear it. Its working and KDE is much better, than before. Hello, now I’m downloading Linux Mint, this is the first time I’m going to interact with Linux Mint, I’m actually interacting with Linux OpenSuse, and Linux Ubuntu client, I love the Linux Mint desktop, the Linux Mint desktop looks like Linux Opensuse desktop. kde 4.9 doesn’t work with mint kde as it is in the backports.needs to be adapted. Its the best KDE based distribution I have ever seen, easier than Open Suse and better than Kubuntu. Its a perfect combination of elegant desktop and ease of use. Keep up the good work guys !!!! KDE 4.9 works fine within Mint 13 Maya. Many thanks by the Mint Greek Community for another fine release. I just installed LM 13 KDE edition and upgraded KDE to 4.9 using the kubuntu backports (see comment #127) and so far it’s working fine. Nice job on the release Mint team. I’m waiting for your future creations.